← How Can You Benefit from a Homemaker? As you grow older, you have to remember that your parents are growing older too. As a child, you may feel a sense of responsibility to take care of them; however, time and circumstance may not always permit it. You may be busy with other responsibilities or you may be living too far from them. In such cases, you have to start thinking about care options. Talk with your parents and listen to their preferences. If they tell you that they would rather stay at home rather than move to a care facility, Heaven Sent Home Support Services can step in to help you. We are a provider of in-Home elderly care assistance in Southeast Michigan, and we are ready to provide the assistance that you need. Personalized care. 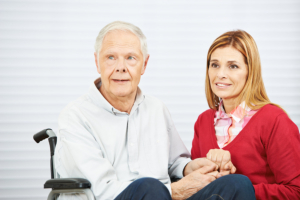 Homecare providers all focus on one goal: to provide the highest quality of personalized services specific to your needs. We take the time to listen to your requests and we do our best to address them. By delivering personalized services, we want you and your loved ones to be able to continue to live in the comforts of your own home as you receive the care that you need. Keeping your family together. In times of sickness or old age, having your family around can be very reassuring. This is particularly true for seniors who may start to feel isolated and disconnected from their family. Moving them to a care facility may make them feel even more isolated, so letting them stay at home can definitely do some good for them. For injured and sick individuals, having their family around for support can help them stay motivated throughout their recovery. Allows for more independence. Majority of seniors fear moving into a nursing home because they think that they will lose their independence. They would rather stay in their own home where they feel comfortable, surrounded by a familiar environment and their loved ones. With our in-home care services, we provide our clients with independence and control while being there for them when they need support. It is a more affordable option. Compared to other care options such as nursing and care homes, getting in-home care is a more affordable option. Moreover, finding a home care company with reasonable rates can help you save even further. Also, please keep in mind that at Heaven Sent Home Support Services, we don’t compromise the quality of our services despite our affordable rates. So, if you are in need of In Home Private Duty Care in Southeast Michigan, please don’t hesitate to reach out to us at 248-262-7111. Let us know how we can help you and your family.